Just saw these healthy lunch recommendations online and I just thought of sharing this in this blog for those picky eaters out there or better yet to those who are craving for delicious meals that are easy to prepare and can bring to work everyday. Not only that, these are low in calories and nutritious too. I love that wrapped salad! It's very easy to prepare and really healthy. 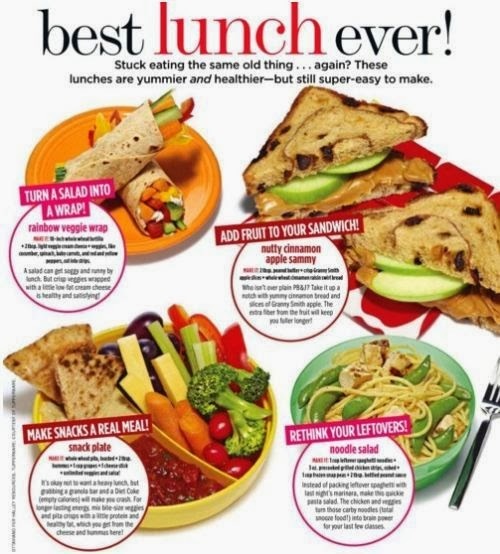 :) Sandwiches are always a great and filling meal especially if you add some veggies on it. I remembered the Bahn Mi, a kind of sandwich sold in Vietnam which I always buy during my stay there. It's really delicious and filling. One sandwich is enough for my lunch or dinner. It is packed with veggies and some meats and so yummy! Another one is pasta. I think this is the easiest to prepare next to sandwiches and this can help you redo your left overs by just mixing any of your left over meat in your cooked pasta. Just few drops of olive oil and some soices and you're ready to go for another hearty meal.